Thanks to the generous donations from two couples, the students at NIU’s School of Nursing can decompress in a comfortable on-site lounge. 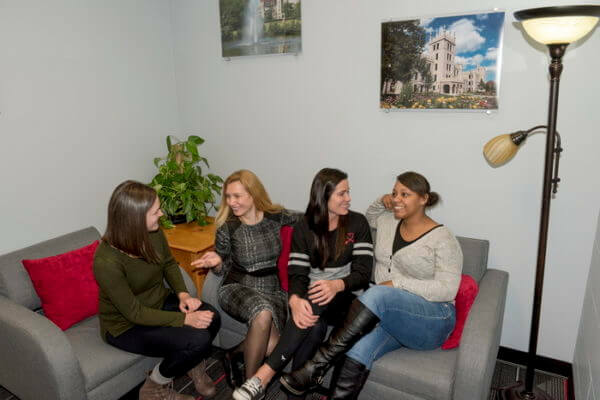 The lounge has always been an oft-used respite for nursing students who attend nursing classes further away from NIU’s main campus. But the furniture had seen better days, and the room lacked appropriate spaces for studying, gathering, relaxing and recharging batteries – both personal and electronic. When NIU alumni Earl and Cindi Rachowicz (’73) and Clay (’66) and Ethel Hock (’65) asked Nursing School Chair Jan Strom how their contributions could support students, remodeling the dilapidated lounge was suggested. A gift from the Rachowiczs made the lounge update possible. Furniture was reupholstered, new tables added, walls painted and adorned with photos, and new carpet installed. The serenity room, an enclave off the main lounge, received an update as well, thanks to the Hocks’ gift. This room, with comfy furniture including a gliding rocker and soft lighting, offers a quiet space for reflection. Including the serenity room was particularly important to Ethel Hock, who was a leader in her nursing school class over 50 years ago. More than 70 nursing students and faculty attended the lounge grand re-opening Nov. 16. One of those is nursing student Rachel Shapland, a junior from Peoria, who thanked the Rachowitczs and the Hocks for their contributions.